I’ve written before about the Restroom Access Act (Ally’s Law) and how important it is to get it passed in states across the country in order to ensure that patients with inflammatory bowel disease and other illnesses are able to access employee only restrooms in stores when a public one is not available. Well New York, it’s your turn to act! In 2013, the New York State legislature attempted to pass the Restroom Access Act but it was never brought up for a vote. Earlier this year, Assemblywoman Amy Paulin (D-88) and Senator Kemp Hannon (R-Nassau) introduced the bipartisan Crohn’s and Colitis Fairness Act in the New York State Assembly and Senate. If passed, this bill would amend New York State public health law to provide individuals with “Crohn’s disease, ulcerative colitis, irritable bowel syndrome, or any other medical condition that requires immediate access to a toilet facility” access to employee-only bathrooms when a public one is not available. Sounds great, right? It would be, but it won’t pass without your help. It’s up to you, New York, to make this bill become a law. This post originally appeared on the Huffington Post; however the stories included below are the full versions and not the ones that appear externally. December 1 marks the start of Crohn’s and Colitis Awareness Week, an important week within the inflammatory bowel disease (IBD) community to bring attention to Crohn’s disease and ulcerative colitis (UC), two debilitating digestive diseases that cause crippling abdominal pain, persistent diarrhea, rectal bleeding, and weight loss. More than 1.4 million Americans live with these diseases, yet most people are unfamiliar with them, thinking that IBD and irritable bowel syndrome are synonymous, or downplaying the symptoms. As Geswell says, it’s hard to grasp the reality of living with these diseases. So in order to explain what it’s like have an inflammatory bowel disease, I asked several patients to share their experiences. Last year, Massachusetts became the 13th state to enact the Restroom Access Act, joining the ranks of Colorado, Connecticut, Illinois, Kentucky, Michigan, Minnesota, Ohio, Oregon, Tennessee, Texas, Wisconsin and Washington. 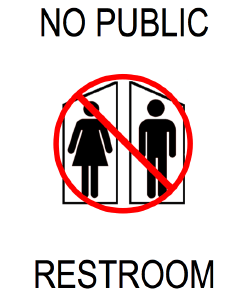 As I wrote previously, the Restroom Access Act requires retail establishments to allow people with certain medical conditions (including Crohn’s disease and ulcerative colitis) access to their employee only restrooms if a public one isn’t available. 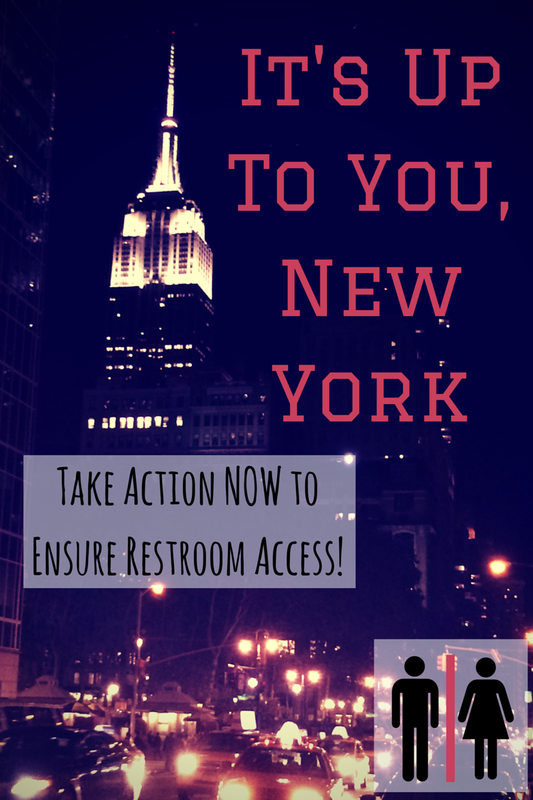 Several other states are starting to look at enacting the Restroom Access Act, including New York. It’s about time! The New York bill was introduced by Assemblywoman Amy Paulin and referred to the Assembly Health Committee. Unfortunately, it hasn’t made any movement in that committee since it was referred there in February. This has been a great year for Caring for Crohn’s, both on the blog and personally. After toying with the idea for several months, I finally launched the blog in June. After a few months on Tumblr, the blog was merged onto WordPress and now here we are! In just six months, I wrote 73 posts and the blog received over 3,600 views, and gained 19 WordPress followers, 50 Tumblr followers, 124 Facebook fans, and 175 Twitter followers. Thank you all SO much for your readership and support– this blog branched out beyond my wildest dreams and I am so appreciative of all of you who made that happen. Without further ado, here are some of the 2012 highlights for Caring for Crohn’s! #13 for the Restroom Access Act! Today, Massachusetts became the 13th state to sign the Restroom Access Act into law. Big victory for IBD-ers. “This bill will provide peace of mind to people suffering from IBD, who will be able to shop without fear of a publicly embarrassing situation,” said Rep. Louis Kafka (D-Stoughton).Kafka sponsored the bill in the House and led an eight-year effort to get it enacted. He introduced the legislation at the request of a constituent, Canton attorney Jonathan Rutley, who drafted the measure for his 17-year-old daughter and ulcerative colitis patient, Catherine (Catie). For those who are not familiar with it, the Restroom Access Act (also known as Ally’s Law) requires retail establishments that do not have a public restroom to allow people with IBD, IBS, other chronic conditions, and pregnant women access to employee restrooms. As you all know, this is very important for IBD-ers. The last thing you need is to be out somewhere that has no public restroom and be denied access and have an accident.